Click on covers for enlarged images. Scroll down for essay. 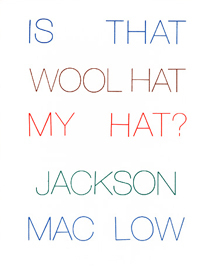 At the end of the millennium, many would say - and I would agree - that Jackson Mac Low was the most profoundly innovative poet of the second half of the 20th century. During the first thirty years of his writing, his poetry may have seemed the most disconcerting or the most ridiculously premised of any being done at the time. I think a fairly large number of people don't find it as obscure today as audiences did, say, thirty years ago, and a century hence readers may wonder why anyone thought of it as “difficult” at all. Most of Jackson’s poetry relies on two premises. The first is that to a greater or lesser degree, it incorporates “systematic chance” processes. The second is that, ideally, it is meant to be performed rather than simply read on the page. The nature of systematic chance procedures may cause some initial confusion, though it leads to a particular type of clarity. In theory, one aspect of chance processes relies on mysticism and the surrendering of the absolute control of the individual ego. As important as that may be, it’s just as important to note how much Jackson’s poems produced by chance sound specifically like him, John Cage’s sound like Cage and no one else, those done by me sound like poems I’ve done in other modes, etc. Without going into a lengthy discussion, it seems simplest to say that such procedures allow a greater number of resources to enter the poetry and to establish a greater degree of collaboration and participation with the world than more conventional methods. This can further vary with the initial design of the poem, which allows for different kinds and degrees of intention on the part of the poet. The nature of cooperation or collaboration links quite naturally with the second premise: that poems created this way have a natural affinity (one might almost call it a desire or a need) to be performed. When performances allow or call for multiple readers, they extend the degree of collaboration or cooperation. This can bring the additional performance skills of all participants into the poems, and it can and should act to stimulate and expand the abilities of those who take part in the work. Most of Jackson’s poems should be considered as scores rather than finished pieces, their possibilities for realization extending toward infinity. Some scores call for the delivery of sentences no more unusual than those you might find in a newspaper. Others break words down to individual letters or sounds so basic that letters don’t really define them. As a result of long practice and broad range, Jackson was consummate in his skills at vocalization. Whether he recited what in other contexts would be plain prose or consonant phonemes cracked to levels that even the standard notation of linguists can’t capture, or whether he used a vowel or syllable as the starting point to create and run something like a musical scale or whether he rapidly and effortlessly combined all of the above, Jackson’s virtuosity was fully comparable to that of vocalists in any musical mode you could name, from rock to opera. His stage presence moved in a different direction. From the first performances I attended in the early 1970s through those I took part in as late as 1976, he had let his hair grow extremely long, and this combined with a whitening beard and his small stature suggested a character like Merlin in the Arthurian legends. Between the summer of 76 and the beginning of the next year, he cut his hair fairly short and began shaving. As styles of grooming changed, he kept from drawing too much attention to his appearance - during the last years of his life, he tended to dress and groom himself like a rather dapper (but not ostentatious) business man. During performances he at times seemed absent minded to the audience. Following him as a fellow performer, you could see how intent he was on vocalization to the exclusion of all else, and if you were a non-performing member of the audience, you’d probably stop watching him and concentrate on the patterns of sound and significance instead. This is precisely where concentration belongs in most Mac Low performances. Ambient sounds (from the audience, from the street) found their way into performances, and I became more acutely aware of these sounds when I was one of the participants. Jackson and I first began discussing publishing his work in 1974 or 75. After a couple possibilities that didn’t seem feasible, we settled on the idea of doing a selection from his Gathas. We spent over a year trying to decide which Gathas to include. During the summer of 1976, when my then-companion Susan and I spent several extended stays at his loft during our annual pilgrimage to the east coast, Jackson and I decided we should do the complete work. At that time it was about 180 pages long, most pages requiring two color printing. Changing Appearance, The Werewolf Sequence and several other large books done as commercial jobs gave me greater confidence in my ability to produce a book of that size and complexity. By this time I had started making elaborate book-objects, some made of soap or human hair or mirrors or other unusual materials, some simply employing large collections (approximately 4 inches thick) of blotter sheets, chance generated collages created in the printing process, etc. These included acoustic books made to be used as musical instruments in performances. I made one of the first of these specifically to use in performances of Jackson's Stanzas for Iris Lezak. Some books made sounds so soft that they were intended to lower the volume of noise in an environment rather than creating more noise. These fascinated Jackson. As common as book objects are today, virtually no one else was doing anything like them at the time. The difficulty of producing these books gave both of us more confidence in publishing the complete Gathas, as a book, as a piece of book art, and as a volume that could be used as much as scores for public performance as for private reading. Our conversations in the summer of ‘76 began a long process for Jackson of trying to finalize the work. Everyone who’s spent any time with Jackson has stories about his fussbudgetry. The following is a favorite of mine. On this occasion, we arrived at the loft just as Jackson’s children, Clarinda and Mordechai-Mark, were leaving to stay with friends in the country. The invitation for this trip had come up hurriedly, and they had thrown together some clothes and other items in a spontaneous and carefree spirit. The loft had a singular layout. There was a room across from the elevator for the children, which they graciously surrendered for Susan and me to sleep in when we visited. A bit beyond this was Jackson’s piano, and beyond that an area I called “Karnak,” a large, densely packed bank of bookcases, filing cabinets and other storage devices that seemed more like the dark and crowded Egyptian temple than the courthouse not too far away whose columns earned it the nickname “The Tombs.” The living room was located at the end opposite the elevator. When approaching it by walking through Karnak, you’d find a bathroom and a kitchenette on the left. To the far right, Jackson kept trestles for audio recording instruments and other devices used in sound poetry and performances. Between these and the kitchenette were mattresses on which Jackson and some of his women folk slept, and where we spent most of our time talking when we visited. The custom of the house was nudism. Before I met Susan, I tended to disrobe in nudist environments, but did so reluctantly, as is perhaps predictable among the sons of ministers. Susan had a different approach. In nudist environments, she removed her clothes except for her blouse. This kept her from coming across as hostile to those who went without clothing, but still preserved two basic forms of modesty. The first being the simple modesty of not wanting to be seen; the second suggesting that she wouldn't mind joining the others but was too shy to do so, and seemed to be apologizing for it. I was happy to follow her lead in this. In mid summer in Lower Manhattan, the heat could be particularly unpleasant, and this degree of dress was much more comfortable than remaining fully clothed. Taking off shoes and socks was a particular relief. The ambiance of the loft had a sincere informality which was pleasant to us. This became all the more clear by its opposite in the loft of another friend’s companion. Photos of this loft had been featured in a glossy magazine, and the proprietress was so fussy about the appearance of the loft that she obsessed about it constantly, even insisting that when she poured us cups of coffee and glasses of wine that we drink them in the kitchen without putting them down on any surface. Thus to drink something, we had to get up from the coffee table, go into the kitchen, drink quickly over the sink, then move back to the faux-casual living room. Although she wouldn’t have understood it at the time, her attitude was sewing the seeds of destruction for SoHo as a place for artists to live and work together. The living room of Jackson’s loft may have been disheveled before Clarinda and Mordechai prepared to leave, but was a complete mess afterward, with what seemed to be perhaps an inch of rubble surrounding the mattresses in the living room. This was not its constant condition - at times, Jackson could keep it tidy. We talked for a while, went out for supper, visited some other friends in SoHo and the Bowery, and returned to the loft. During the conversation there I shifted positions on one of the mattresses and put the sole of my foot squarely down into the rubble. Mordechai had cut the bottom of a soft drink bottle off for a project he had been working on, and, without being able to see it, I planted my bare foot directly on the jagged glass. This produced a bloody circular cut on the bottom of my foot. Nature designed our feet with the same practicality as other parts of the body. The soles have a lot of capillaries, which aid in keeping the flesh nourished while walking and running. It also keeps the passages connected in such a way as to bleed enough to clean themselves out, but not enough to cause serious blood loss or other problems. Had the bottoms of our feet been more vulnerable, we wouldn’t have lasted long enough to invent shoes. I thought the situation was funny, and made some jokes about it as I went into the bathroom to wash off my foot and put a towel around it. The situation upset Jackson. He called from the living room, giving me instructions on how to wash the foot, where antiseptics and bandages could be found, etc. Trying to find the items he mentioned took a while, and his instructions became more shrill. Finally, he came into the bathroom, placed my foot in the sink and began scrubbing it himself. Then pouring rubbing alcohol and peroxide over the cut. Then rewashing it. And continuing to fuss with other first aid measures for perhaps half an hour to forty five minutes. The real danger in this situation was not the cut, but the possibility of losing our balance and perhaps breaking limbs. Once he had fussed enough, we returned to the living room and resumed our conversation. We spent a good deal of the next day walking or standing, and the cut did no more than itch a bit, showing how minor the damage had been. This seems a perfect Jackson fussing story because it reveals not only his fidgetyness, but also his generosity, his concern for other people’s well-being, his hospitality, and his humility. It’s difficult to imagine anyone else of his artistic rank doing something like this - and impossible to conceive of anyone lower on the status ladder even thinking about it - particularly in the ferociously competitive environment of Lower Manhattan at that time. Going through my correspondence with Jackson as I write this, there are plenty of oddities to muse on. What comes through most clearly is his endless generosity, his kindness, and the quality of the associative processes in his longer letters. This latter dimension could use an essay of its own. His uneasiness and frustration in trying to get his FBI files via the Freedom of Information Act, for instance, includes the reminiscences of his political activism as a student. That's part of his discourse that nearly everyone who's spent any time with him remarks upon. The webs that link his own concerns, however, with mini-discourses on Burke and Common Law, on the problems so-and-so is having keeping his rent controlled apartment, the reading he went to last night, a bit of musing on the pronunciation of a word that's about to pass out of common usage, his uneasiness about someone who disappeared years ago, his dissatisfaction with Murray Rotbard's shifting individual Anarchism into a firmer capitalist base, contemplation of the paper covered wires used to close plastic bags, reminiscences of a former love affair, complaints about problems associated with zoning ordinances in his neighborhood, the quotation of lines of Sappho in Greek with commentary on metrics borrowed by Swinburn, the ice-cream making device the kids were using, his anxieties about the logistics of an upcoming trip to a performance, concepts of non-ego in Chan and Theravada classic texts, and so on and on, suggest the thought processes of a poet who could comprehend a world too large for older poetic methods, and whose experimentation strove for a type of newness that included everyone, not simply one that relied on the pleasures of invention. Part of his fidgetry was inextricably linked with three important dimensions of his art: his extreme attention to detail, his exquisite sensitivity to anything that happened to be going on around him, and his desire to include every bit of the world's texture in whatever he did. If this included fidgeting with worry beads and washing his disciples' feet, that may have, in the first instance, been a necessary part of the art; and in the second, a part of his profound humanity. Jackson was magnificent to perform with, once a performance had begun, and conversation with him was equally delightful. His range of knowledge and insight contributed considerably to this. He often enough went into extended monologues. I’m not averse to such modes myself, and though Jackson's attention sometimes seemed to drift when I engaged in them, he often enough referred to something I said in another conversation days or even months later. Despite giving the impression of being absent-minded or distracted, he was a good listener as well as a good talker. Jackson’s piano playing added to the pleasantness of the loft. His musical interests were as eclectic as his conversations, and he as often as not played work by composers such as Massanet and Saint-Saëns - not the sort of thing you’d expect in this part of American Bohemia. In addition to our trips to New York, Jackson got to the midwest at least once a year for over a decade, initially at the invitation of Michel Benamou and Jerry Rothenberg, later for performances I arranged at Woodland Pattern and other venues. After 1976, this invariably included discussions of the Gathas. However exhilarating performances might be, the preparation for them could be difficult. On one occasion, I spent an afternoon with him setting up speakers and microphones. We then went out for supper. When we came back, half an hour or so before the time when the performance was supposed to start, we found that the university’s audio-visual department had taken all the equipment out of the room and replaced it with other amps, mikes, speakers, etc. Jackson was exceedingly distressed by this for a few moments, but then apparently forgot about it. At a solo performance, he gave me a tape recorder and some tape and told me to turn the tape over when it ran out, and to put another one in if both sides were filled. When the first side came to an end, I flipped it over and pressed the record button. Jackson, however, eyeing me and the machine nervously, wasn’t sure I’d done this right and stopped in the midst of a stream of abstract sounds, came off the stage, took the recorder, looked through the plastic pane covering the tape, and, seeing that the gears were indeed turning, returned to the stage and resumed his performance. A number of Jackson’s friends joked about the impossibility of getting the ms. for the Gathas out of his loft. While he fussed over the copy, I did a number of small projects. 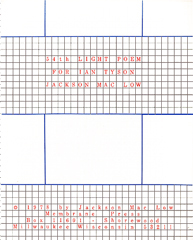 Perhaps the most important of these was 54th Light Poem: For Ian Tyson, which I published in 1978. An important feature of these smaller works is that completing them usually meant Jackson would perform them the next time I saw him, and if the piece was for multiple voices, I might get to participate. In 1979, I achieved what a number of people had considered impossible: I got the Gathas out of Jackson’s loft and into my studio. Jackson wasn’t satisfied with the first half dozen pages I printed, claiming the black letters didn’t correctly register with the blue grids in which they fit. The problem here was not in the printing, but an optical illusion caused by the difference in paper and the difference between the ink that comes on pre-printed paper, the ink that comes from pens, and the ink that an offset press lays down when reproducing pages that have aged. Had Jackson not hallucinated at this point, I would have been able to get the book done in at most six months. I wasn’t sure how to proceed from here. Perhaps a different stock would help. In the midst of deliberations, I began a new love affair. Jackson came for a performance while this was still in its first flushes. At this time, the impossible triumph undid itself: Jackson insisted on taking the copy back to New York with him. Perhaps if I hadn’t been so enthralled with the new lady, I would have been able to devise some means of hanging on to the ms, but whatever the case, it left my studio. In the next three years I had two accidents which temporarily incapacitated me. The first occurred on the loading dock of a bindery and left me with a ruptured disk in my spine. A year and a half later, I got my right index finger caught in the gears of my press. Both accidents required a bit of recovery time, though not enough to prevent doing the Gathas. Before both these incidents, Jackson said he would get the copy back to me, but decided not to after each mishap. In 1982, I decided that doing his Is That Wool Hat My Hat? as a more elaborate score than the copy he had sent me might make a beautiful book, an eminently useful score, and might just persuade him to get the Gathas copy back to me so I could resume work on it. Printing Wool Hat in four colors made it labor intensive, and easier for performers to use. In 1984, my manic-depressive disorder moved into a period of full collapse - assisted, predictably, by the excessive dosage and rapid switching of psychiatric drugs psychiatrists push on people at precisely the wrong times. I attempted to end my life on December 1 of that year. The triggers for this probably included going for several years at a ferociously intense and relentless level of creativity. After about six months of physical recovery, I spent most of the next four years in the country, keeping only minimal contact with poets. Just before his surgery in 1988, bpNichol told me in a telephone conversation that I’d had enough of a vacation, enough time to recover, and that I should resume work, bringing my new companion and her children into the process with me: even if they weren't particularly interested in this, he felt sure they would become so given a little time and exposure. He insisted that I should continue a number of projects about which he was enthusiastic if he did not make it through the surgery. He did not make it. I took his admonition as a sign that I should indeed return to writing, publishing, and the other activities that I had put aside. Publishing proved particularly difficult, however, since I no longer had presses with which to print books. I managed to buy a good quality photocopier with provisions for color cartridges. I had previously tried to convince some of the people who do exquisite letter press editions to pull proofs on hard surfaced stock without too much punch or dwell so that I could make offset editions of their books, enlarging the audience not only for the work published but also showing just how good traditional typography could be to people who hadn’t seen much of it. I had managed to do this with Walter Tisdale’s edition of Ted Enslin’s The Weather Within. Charles Alexander decided he would like to work with me in this way. We made arrangements for me to reprint two books by Paul Metcalf, Golden Delicious and Firebird, and Jackson’s French Sonnets from his type. Anne Tardos did computer-based cover and endpaper graphics for the new edition of French Sonnets. We thus had a Rube Goldberg set of production procedures, ranging from type such as Aldus Manutius might have set 500 years earlier to Anne’s computer images printed by me using nothing but a photocopier. This reminds me of the odd combinations of methods from the mimeo days. French Sonnets is less a score than most of Jackson’s work. It is an utterly delightful read, though, silent or aloud. And its beaming joviality seemed a good note on which to end my printing of books by Jackson on paper. After this, I published several of his works on the web - perhaps we could see French Sonnets as a transition from doing original work to anthologizing. I wasn’t able to get the Gathas done, and at this point feel sure I never will. Given the expense of color printing, there’s a good chance the complete collection will never see print. Looking back over what is now just a few months under 40 years of publishing, not being able to do this book remains my biggest regret. Printing as often as not had something like a party element to it. But this should not obscure the fact that it is always hard work and has multitudinous frustrations and agonies associated with it. The most common physical problems for me came in the form of respiratory pain from working in an unventilated basement and getting rashes and burns from press chemicals. Occasionally, an alternative publisher may sustain significant wounds to the back, and at the time I started printing, it was unusual to find a print shop that didn’t have at least one middle-aged employee with one or more missing fingers. I came within an ace of joining that fraternity. Although in rare instances you might bring in money, alternative publishing is a money hemorrhaging enterprise, in which breaking even does not include paying yourself for your labor, just covering costs of materials. No matter how good a job you do, there’s always some nagging little thing that will bother you about every book you produce, and these little heartaches resume every time you look at the book for decades to come. You don’t get strokes from reviewers and seldomly from anyone else - though you do get blamed for anything that goes wrong. These are just some of the blood, sweat, and tears that readers never see. Nor should they. Yet no matter how many problems I’ve run into, the books I’ve done have all had their satisfactions. They’ve been more than worth the effort, even when the work has been most frustrating. My greatest unhappiness in publishing has come not from accidents, wounds, mistakes, difficulties - even such parts of an artist's life as silly as incidents in which you get your foot cut or as dramatic as manic depressive disorder and attempts at suicide. In the work I have done in print and on the web, those I have not been able to do are the ones that really hurt. The early death of friends is not specific to publishers, but part of everybody's life. That the Gathas is absent from this retrospective expresses my greatest regret as a publisher. That, however, doesn’t mean that I didn’t have a great time with the titles shown here. I wrote the first draft of this essay as part of another one toward the end of 2003. The essay was about four poets, and set up as a sonata. In that instance, it was paired with the first draft of my notes on Toby Olson. The Toby section was an alegro suggesting the pleasantness of the process. Jackson's section was a complex adagio, including scherzi but generally meditating on the difficulties and regrets involved in publishing books. I revised it near the end of 2004 for my first attempt at this retrospective, several days after Jackson's death. Now, at the beginning of 2006, I have had a year to pretend I'll get used to Jackson's absence. Even though our communication had been by letter and telephone during the last decade and a half of his life, it seemed there'd be a time when I'd get back to Lower Manhattan and resume conversations from a another era. The progress of this article suggests how much of a Jackson-like fussbudget I've become myself. I assume appreciations from poets and other artists will be forthcoming in the following years. I did a memorial suite of visual poems shortly after Jackson's death and incorporated them into a project Mail Artist Reid Wood and I have been developing for the last twelve years. I wrote an extensive essay for Jackson's 75th birthday, and imagine I will continue to write about him as long as I continue writing crit. As was the case when I was writing the first version of this essay, it's easy enough for me to recall in acoustic memory performances of The Pronouns and Stanzas for Iris Lezak. It's also easy to remember Jackson, the most innovative poet in the English speaking world, playing lush, effulgent, and delightfully out of fashion music on his piano in his loft on the edge of SoHo, during its time as Planet Earth's artistic center. Whatever the losses along the way may be, Jackson was the great poet of fullness, of infinite possibility, for our time, and the contrast between what I published and what I wanted to publish suggests how much publishers will have to do in the future to adequately make available the poetry of their own time. I hope it suggests how completely worth it all the blood, sweat, tears - and even major losses - can be. Click here to go to Karl Young's essay "Two Representative Works of the Last Decade; A Working Present for Jackson Mc Low on His 75th Birthday." This essay includes detailed reviews of Mac Low's Open Secrets audio cd, and the book, Words nd Ends from Ez, and a survey of Mac Low's opus.